Arachnoid cysts (AC's) are congenital malformations commonly located in the temporal fossa and sylvian fissure regions. They are usually asymptomatic but may present with seizures, mass effect or with bleeding manifestations. Subdural hematoma (SDH) on the other hand is usually found in the elderly in the setting of cerebral atrophy wherein the potential subdural space [closed in the young due to apposition of brain to the dura] opens up. Numerous studies have stated AC's to be a predisposing factor for SDH in the young. We present one such case and review the available literature. A 15-year-old boy presented with progressively increasing holocranial headache and multiple episodes of vomiting of 1-week duration. There was a history of trivial trauma to the head 2 weeks previously, not followed by any loss of consciousness, seizures, or ENT bleed. He had no visual complaints. On examination, he was conscious and oriented with normal higher mental functions. Extra-ocular movements were full. He had bilateral papilledema. Other cranial nerve functions were normal. There were no focal motor deficits. The left plantar was extensor. 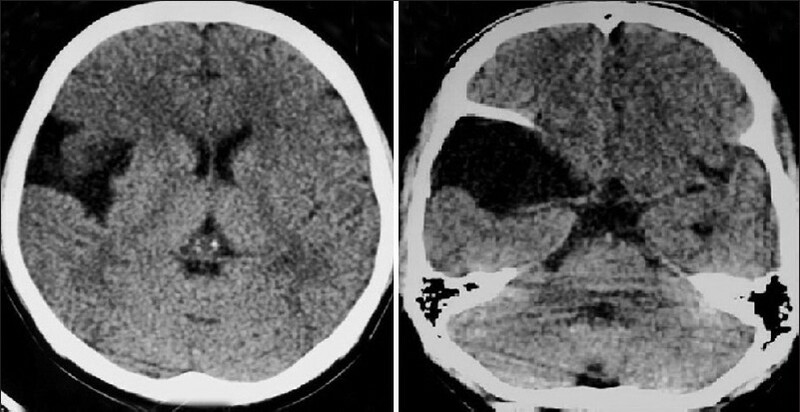 CT scan of brain showed a right-sided sub-acute subdural hematoma (SDH) isodense to brain with significant mid-line shift to the left. Cortical sulci were effaced. There was also a right temporal arachnoid cysts (AC) which was isodense to cerebrospinal fluid (CSF). There was no intra-cystic hemorrhage [Figure 1]. 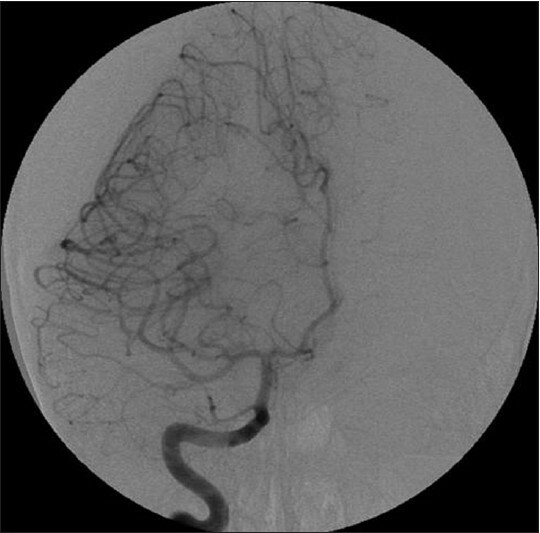 The patient underwent a digital subtraction angiogram (DSA) which showed no evidence of any aneurysm or intra-cerebral or dural arteriovenous malformation [Figure 2]. The middle cerebral artery (MCA) branches were pushed medially by the extra-axial SDH [Figure 3]. He underwent burr hole drainage of the SDH. Post-operative period was uneventful. Follow-up CT scan showed resolution of the SDH and restitution of the mid-line. The AC continues to remain the same size [Figure 4]. At 3 years follow-up the SDH has not recurred and the patient is asymptomatic. ACs have been stated to be a pre-disposing factor for development of SDH. In 658 patients with SDH reviewed by Parsch et al., 16 were found to have AC (an incidence of 2.43%). This was five-fold greater than the prevalence of ACs in asymptomatic patients.Wester et al. found SDH in 11 patients of 241 cases of AC referred for treatment (an incidence of 4.6%). Iaconetta et al. have mentioned the annual risk of bleeding in patients with middle fossa ACs to be probably less than 0.1%. Page et al. first highlighted the relation between AC and SDH speculating two reasons for the association: Firstly magnification of pressure waves, following trauma, within an AC compared to normal sub-arachnoid space with rupture of bridging veins and secondly lower compliance of cyst wall compared to normal brain tissue with tearing of unsupported bridging veins after trauma. Kocaeli et al. have described a patient (25-year-old male) with MCA bifurcation aneurysm that bled into an AC and leaked into the subdural space causing SDH. Conversely, Domenicucci et al. state that ACs, in patients diagnosed with SDH, are only incidental findings since the neurological symptoms are due to mass effect of the SDH alone, the patients can be managed by simple burr hole drainage and post-operative clinical course is same as that of SDH without ACs. They further draw upon histological evidence to show that ACs and SDH are two "separate non-communicating entities." Takayasu et al. also hold that AC does not contribute to SDH formation and that tackling of the cyst is not necessary if it was previously asymptomatic. Mere drainage of the SDH is sufficient treatment. The same was done in our patient. Our patient too was an adolescent male with symptoms of raised ICP that regressed after draining of the SDH. While an aneurysm had been ruled out by DSA, the role played by the AC in SDH formation can only be speculative. If he has no further bleeding episodes the AC may well be coincidental. While the association of ACs with SDH is well documented, the role that ACs has (causative vs. coincidental) in SDH formation is of more than academic interest as it raises the issue if mere drainage of the SDH alone will suffice or whether the cyst must also be tackled to prevent recurrence. We feel that while AC may be a risk factor for the development of SDH in young, burr hole drainage will probably suffice for the majority in the absence of recurrence or intra-cystic hemorrhage. However, DSA must be done to rule out an aneurysmal rupture before tackling the SDH. Patients with incidentally detected ACs also need to be counseled regarding the possibility of development of SDH in the future and to avoid contact sports and head trauma. 1. Parsch CS, Krauss J, Hofmann E, Meixensberger J, Roosen K. Arachnoid cysts associated with subdural hematomas and hygromas: Analysis of 16 cases, long-term follow-up, and review of the literature. Neurosurgery 1997;40:483-90. 2. Wester K, Helland CA. How often do chronic extra-cerebral hematomas occur in patients with intracranial arachnoid cysts? J NeurolNeurosurg Psychiatry 2008;79:72-5. 3. Page A, Paxton RM, Mohan D. A reappraisal of the relationship between arachnoid cysts of the middle fossa and chronic subdural haematoma. J Neurol Neurosurg Psychiatry 1987;50:1001-7. 4. Iaconetta G, Esposito M, Maiuri F, Cappabianca P. Arachnoid cyst with intracystichaemorrhage and subdural haematoma: Case report and literature review. NeurolSci 2006;26:451-5. 5. Chan JY, Huang CT, Liu YK, Lin CP, Huang JS. Chronic subdural hematoma associated with arachnoid cyst in young adults: A case report. Kaohsiung J Med Sci 2008;24:41-4. 6. Kocaeli H, Korfali E. Rupture of a small middle cerebral artery aneurysm into middle fossa arachnoid cyst presenting as a chronic subdural haematoma. ActaNeurochir (Wien) 2008;150:407-8. 7. Domenicucci M, Russo N, Giugni E, Pierallini A. Relationship between supratentorial arachnoid cyst and chronic subdural hematoma: Neuroradiological evidence and surgical treatment. J Neurosurg 2009;110:1250-5. 8. 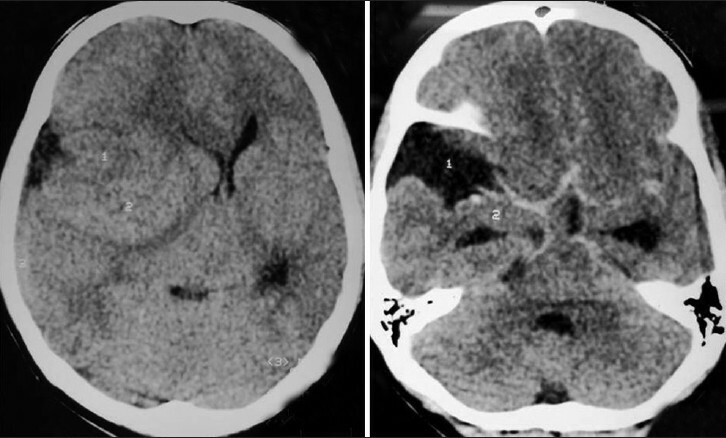 Takayasu T, Harada K, Nishimura S, Onda J, Nishi T, Takagaki H. Chronic subdural hematoma associated with arachnoid cyst. Two case histories with pathological observations. NeurolMed Chir (Tokyo) 2012;52:113-7.